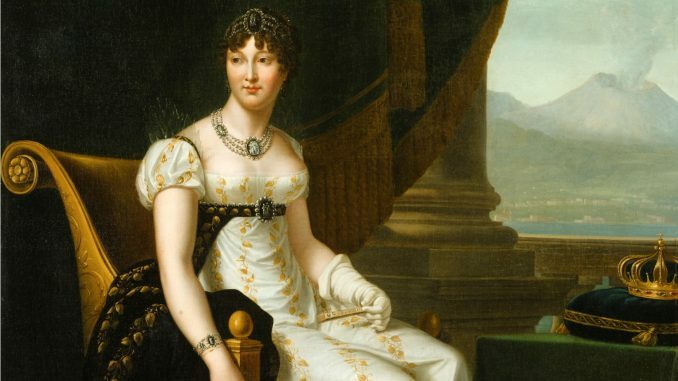 On 20 March 1811, Napoleon’s second wife Marie Louise gave birth to a son. Napoleon had an heir at last. He wrote to her, “My sister, I love to associate you with all my happy occasions, and I should like you to be godmother to the son whose birth has overwhelmed me with joy.” She couldn’t go due to her health but appointed Hortense as her proxy. The beginning of the year 1812 brought to no improvement in Caroline’s health, and she resorted to drinking only milk before slowly introducing solid foods again. She slowly felt a little better. Murat was captured by the forces of King Ferdinand IV of Naples and condemned to death for treason. Murat wrote a final letter to Caroline, “My last hour has come, in a few moments I shall have ceased to live. My life was not stained by any act of injustice. Farewell, my Achille, farewell, my Laetitia, farewell, my Lucien, farewell, my Louise; show the world you are worthy of me. I leave you without a Kingdom and without means, in the mids of my numerous enemies. Show yourself superior to misfortune; think of what you are and of what you have been. God will bless you. Do not curse my memory. I declare that my greatest grief in the last moments of my life is to die far away from my children.” He enclosed a lock of his hair with the letter. He was executed by a firing squad. Caroline had to read about her husband’s death in the newspapers and reportedly had several violent fits. She and her household went into deep mourning. She wrote to Hortense, “My children have a father no longer, my dear Hortense, he has perished and with him is lost all hope of good fortune for my family and me. We will weep for him all our life. My children are all that I can wish for, they alone can give me the strength to support so many misfortunes.” Caroline tried to retrieve some of her personal items from Naples as well as the confiscated properties in France. One of the men helping her with this was Francesco Macdonald, and some believed that she married him in 1817, but there is no evidence of this. He probably did become her lover. In 1823, her eldest son, now an adult, moved to the United States. He bought an estate in Tallahassee and started farming. In October 1823, Laetitia married Marquis Pepoli, not quite the brilliant match but not too bad for an exiled Princess. In August 1824, Caroline became a grandmother for the first time when Laetitia gave birth to a daughter. In 1825, Lucien too sailed to the United States, and Louise married Count Guilio Rasponi of Ravenna. With her daughters settled, Caroline thought about joining her sons. Achille married Catherine Bird Willis, a great-grandniece of George Washington, in 1826. Lucien married Caroline Georgina Fraser, an heiress, in 1831.